Always evaluate the communication abilities of your offshore outsourcing vendor along with technical and operational competencies. So you've decided to outsource certain functions to India as part of a corporate revenue and growth strategy and are scouting around for a outsourcing partner. Bear in mind that while judging the technical and operational competencies of potential vendors, you need to simultaneously test their communication abilities too. An outsourcing deal is a long-term relationship and anything short of open and honest communication can wreck the partnership. (c) Commitment to deadlines. While Indian technical competencies are rarely ever in doubt, a huge chunk of the Indian BPO workforce has a long way to go in the communication skills department. Most companies train their employees in these areas but a customer needs to know if honest communication is ingrained in the vendor's work culture. To help you decide whether your vendor can successfully bridge the cultural divide, here is a step-by-step guide to things you can do and look out for during the negotiation phase to avoid problems later on. At the outset, there are the absolute basics that potential BPO vendors must do. 1. Establish credentials: Your vendor should be able to prove his company's credentials in terms of past work done - provide you work samples if needed - as well as the firm's ability to conform to your requirements. The vendor must be well-versed with the kind of compliance standards your process demands and clearly understand its importance. 2.Business proposal: The proposal a vendor submits must be detailed, transparent and must emphasize HOW the job will be done. Often, less experienced companies will tell you WHAT they can or will do but become vague when asked to explain in a step-by-step manner HOW this will be done. If they cannot explain a predictable and repeatable process, they have not understood you as a client and are not worth doing business with. Clearly defined roles and responsibilities (task specific channels), especially those related to reporting progress on the job. A dedicated single point of contact on both sides is a must for smooth functioning, as is a detailed issue escalation system. The reporting system in turn must clearly specify the traceable and non-traceable modes of communication that will be used so that you can monitor progress every step of the way. The proposal must establish specific milestones for all phases of the project and how you can track whether or not things are being done on time. One problem with many Indian vendors is the tendency to inform customers about delays and problems at the time of delivery. It has to do with the mindset that a client will think less of them and their abilities if they admit to a problem. Many continue working in the hope that the problem will be resolved before the deadline and the client need never know that they goofed up. This is changing, but as a customer you can ask for a transparent problem-reporting system and a plan on how it will be implemented. 4. Security/Compliance standards: The proposal must state in detail the compliance/security requirements for the task and also how the company will ensure that its workforce understands and implements these. 5. Training for staff: The vendor must clearly state the exact nature of the domain knowledge and communication training planned for its staff. This is a must in the Indian context because many fresh graduates often don't know how to use their knowledge in practical applications. Sometimes, even people with a few years of experience think what they know is enough to do the job. Worse, they don't understand or know how to deal with the work culture of Europe/America. A potentially destructive combination, but it does exist. So look into the vendor's technical and soft skills training programs and insist on specific training if necessary. 6. Technical communication infrastructure: This is no longer a problem since good Indian BPO providers possess or have easy access to world-class computing, networking and security-related technical infrastructure. Communication via email, instant messenger and teleconferencing is the norm. Bandwidth and connectivity are no longer an issue. So beware of vendors who say that they can 'make do' with anything less than what you want. Outsource2india is a leading outsourced services provider, headquartered at Bangalore in India. With expertise across a wide range of services, we help our global clients achieve process efficiencies, lower costs and quality output. We offer world-class services in Data Entry Services, Finance and Accounting Services, Software Development, Research and Analysis Services, Photo Editing Services, Web Analytics Services and more. Contact us here for your outsourcing requirements. So far, so good. Now comes the tough part: quantifying the human aspect of things in an agreement. It's practically impossible. But you can pre-empt that with a few simple DOs and DON'Ts to ensure that your outsourcing plan isn't destroyed by a vendor who can't bridge the culture/communication chasm. 1. The first step: Most negotiations start off with letters of inquiry. How long did it take the vendor to answer to your email? How comprehensive was the reply? Was it personalized or did it seem like a one-size-fits-all kind of response? If you're satisfied, ask to interact with not just the business development team but with some operations people as well. Check their responses along the same parameters. If a company refuses to let you interact with any operations people, you'll know something is not right. 2. Let's get talking: Beware of vendors who don't want to actually talk to you and prefer to do everything via email at the negotiation stage. Even if the vendor can't meet you personally, they should be willing to hold conference calls where individuals/teams from both parties can hold open discussions. Verbal interaction will allow you to judge a host of things from basic language and communication skills to attitude and work culture. Spend a little time to get to know these people and what makes them tick. Then you'll know whether or not you want to do business with them. DID THEY SAY, "YES, WE CAN DO IT," TO EVERYTHING YOU SAID? WHEN YOU ASKED HOW, THEY SAID, "DON'T WORRY." This is a common problem in India: promising the moon and worrying about delivery later. It's not a conscious attempt at misleading you. A lot of people honestly believe that they can deliver even if they don't know how it's going to be done. However, ignorance of the international work culture is no excuse and you'd do best to steer clear of such firms. DID THEY SAY 'YES' TO EVERYTHING DURING THE TELECONFERENCE BUT FOLLOWED IT UP WITH EMAILS ABOUT MATTERS THAT COULD HAVE EASILY BEEN DISCUSSED DURING THE CALL? This is another common problem: listening comprehension. When listening skills are poor, many people often take copious amounts of notes during a teleconference. Understanding comes only when they pore over their notes so they write back for clarifications. A waste of everyone's time and very frustrating. There are plenty of courses available on teleconferencing skills: this company needs to invest in training right away and you need to find another vendor to evaluate. At O2I, we have vast experience in serving a large number of global customers. Outsource to O2I and get access to high-quality services at a cost-effective price!
" you know you're on the right track. If you're not sure, get them to repeat what you said to check if they've understood. Remember that the communication skills of a business development team are usually better than that of the operations division. If they're not up to scratch, scratch that vendor from your list. DID THEY SAY, "I'M NOT SURE," OR "I DON'T KNOW, BUT I'LL LOOK INTO IT," TO SOMETHING? Shortlist this vendor - this one's honest enough to admit his limitations. This also reflects transparent communication. If you can find a candid vendor, the chances of losing control of your operation are limited. DID THEY WANT TO KNOW MORE ABOUT YOUR REASONS FOR OUTSOURCING, ABOUT YOUR FUTURE PLANS AND NOT JUST VIS-À-VIS OUTSOURCING? Pay attention to such vendors. For one, they're trying to understand your entire business, your work culture and what your company is all about. But more importantly, they're interested in partnerships, not simply in doing a job and stopping at that. These are the vendors who want to grow with you, understand that change is inevitable and will happily adapt. You can expect cooperation such partners who will add value to your business and in the end it can be a win-win relationship. DID THEY ASK A LOT OF QUESTIONS AND EXPRESS A CORRECT UNDERSTANDING OF NOT JUST THE TECHNICAL STUFF BUT OF YOUR BROADER PLANS? More than what a BPO provider is expected to do, they must understand the implications of the job at hand. These guys don't wear blinkers and will keep in mind your big picture. IN LATER INTERACTIONS, DID THEY MAKE CONSTRUCTIVE SUGGESTIONS? HOW DID THEY RESPOND TO SUGGESTIONS FROM YOU? Beware of those who say: "But you said this earlier and that's what we're working on." While a vendor has the right to ask for time to think about a suggestion for change, you can judge a lot about its flexibility by the immediate response to it. You don't want a BPO provider who keeps waving the contract in your face. 4. The internal workings of the company: Ask about how the company is structured and how they work. How are the employees treated? Do they have a vision, a mission statement, a consciously-defined work culture? When a company is up front with its own workers, it is unlikely to hide much from its customers. Outsource your services to O2I and give your organization a competitive edge! 5. Offices outside India: Many smaller players don't have offices outside India but that doesn't mean they're not good. However, if a company does have offices abroad, it is an indication of its success and the fact that it has exposure to foreign work cultures. To an extent, this contributes to bridging the culture gap. We hope this article provided you with valuable information, which will help you to make more informed outsourcing decisions. Please get in touch with us at Outsource2india if you are interested in outsourcing to India, or even if you would just like to find out more. Contact us with your outsourcing requirements. 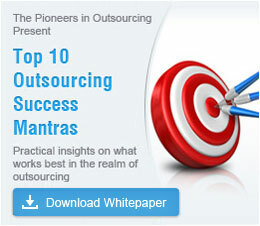 Key factors to evaluate in your prospective outsourcing partner.